Throughout the ’80s and the early 90’s, action movies were really in a league of their own. This was a time when all an action movie really needed to be good was a jacked guy like Stallone or Van Damme to just be present and take out wave after wave of bad guys, and ultimately saving the day. It was something of an innocent time for the genre where audiences could just tune the real world out for a few hours and just watch mind numbing action/adventure. In 1993, a movie called Demolition Man was released starring Sylvester Stallone and Wesley Snipes. This film has become regarded as one of the high points for the genre at this time period, and while I agree it does have a few more brain cells than some, it suffers from some pretty awful dialogue and a slew of jokes that fall flat. In 1996, Los Angeles is overrun with crime and violence which causes the LAPD to really crack down including Sgt. 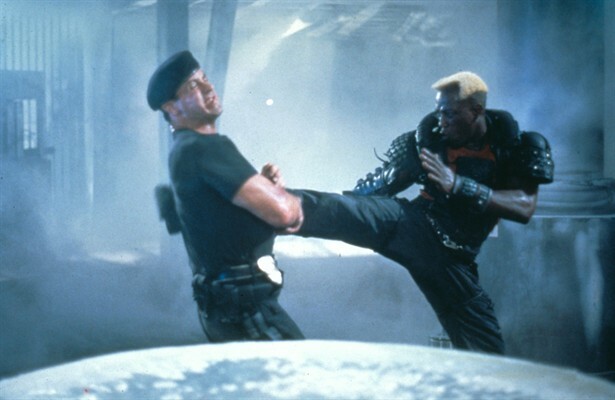 John Spartan (Sylvester Stallone), a tough as nails cop who has earned the moniker “Demolition Man.” Known for causing destruction in his pursuit of justice, Spartan meets his match in the super violent criminal Simon Phoenix (Wesley Snipes), who wrongly gets Spartan arrested. Both men are then cryogenically frozen in the new prison system to be rehabilitated until their release in the next century. When Phoenix is taken out of stasis in 2032 in a future that has been completely peaceful for years, he sees an opportunity to take the city for himself using methods the police aren’t capable of handling. This prompts Lt. Huxley (Sandra Bullock) to propose unfreezing Spartan to bring down Phoenix. When Spartan is released, he resumes his one man war on his archenemy, and the new city of San Angeles is in for some serious problems. If you’re looking for a completely original sci-fi/action movie, this is not the best place to start looking. 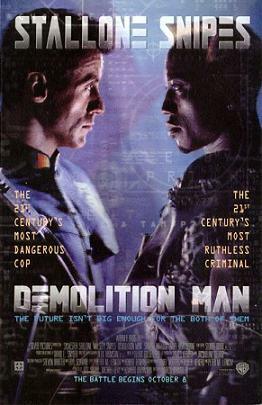 Think of Demolition Man as a cut and paste collage of many different science fiction books and movies rolled into one less than fantastic blockbuster. There are so many clichés throughout the film’s run time that you can begin to lose count. The utopian landscape, the underground rebels, and the whooshing sound effects have all been done so many times before. There’s even a character named Huxley, which I look at as the film saying they were directly (almost too directly) inspired by Aldous Huxley’s novel Brave New World. The makers of this movie were even almost sued by a Hungarian author named István Nemere who claimed that almost every aspect of this movie was ripped straight from one of his novels. These claims proved to be true, but he chose not to sue because of how much it cost to sue a Hollywood studio. Pretty rough stuff, if you ask me. Beneath all of the derivative and repetitive parts of Demolition Man is still some stuff to enjoy. For one thing, we get to see Sylvester Stallone and Wesley Snipes go head to head. That alone is pretty cool. Stallone seems to be having a great time with this movie and has some pretty funny moments amidst his action sequences which we already expect to be great. The real scene stealer, though, is Wesley Snipes. Snipes makes Simon Phoenix really come alive and commands every hectic scene that he’s in as the over the top villain. His design is also really cool with the blond hair and the one blue eye. It adds a physical look of chaos to an already chaotic character. The two actors work really well together and I buy their vengeful relationship very well all the way up to the awesome climax where the two face off for the last time. The writing in Demolition Man is as hit or miss as you can possibly get. When Spartan and Phoenix are first released from their cryogenic stasis, things started to go real south for me in terms of the dialogue. The people in this utopian future talk like a bunch of idiots, and I understand that that’s supposed to be the point, but it just doesn’t work. The things they say, like the phrase MurderDeathKill, isn’t particularly interesting or clever. It’s just repetitive, like a lot of things in this movie are. A lot of the jokes also fall flat, but the chemistry between Stallone and Bullock is great which provides a lot of much needed comedic relief. Dennis Leary also has a small part that provides a couple of laughs, but it would’ve been great if his character was more utilized. This movie shines with its action. The hand to hand combat is a lot of fun and the early 1990s special effects work great with the tone of the movie. The final action packed climax was so much fun and culminated in a very satisfying ending. I’ve seen very few movies with Sylvester Stallone and Wesley Snipes where the action was anything but satisfying. It may seem by all of the complaints that I list in this review that I hated Demolition Man. That’s really not the case. In fact, it’s a pretty fun movie if you switch you’re willing to suspend an uproarious amount of disbelief. While this film thinks it’s a lot smarter than it actually is, there are some clever quips and satirical moments that highlight the excellent and nicely shot action sequences. Simon Phoenix is a character I won’t soon forget, and in the end, Demolition Man is a serviceable enough film for fans of the genre.